This Category describes some of the issues with Importing Vehicles, Dealing with the Police, Auto Maintenance & Repairs, City Driving, and Cross Country Driving, plus a bit of fun. 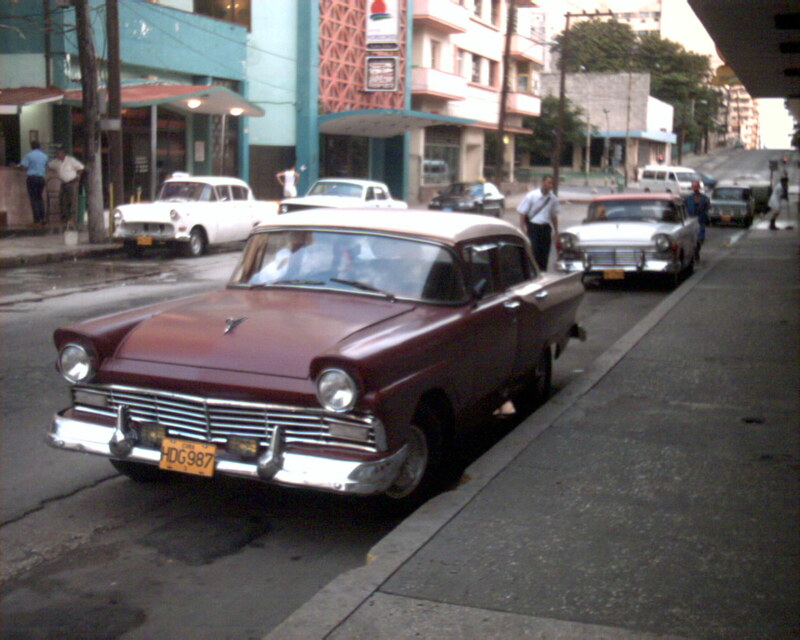 Special thanks to bbc.uk, it.stlawu.edu, jansochor.com, gallery.photographyreview.com, Tommy Images.com, cars-pictures-cars.net, & travelweekly.co.uk for the terrific fotos & much credit to resourceful Cubanos for keepin’ ’em runnin’! Hi Steve, I have a friend visiting in Mexico who drove her car in, got an FMT for 180 days and Car permit. The charge was made to her credit card for the car. She needs to fly out for one week well before the FMT expires. I know that she will have to turn in the FMT at the airport when leaving and get a new FMT on the way back in but what about the car? Can she leave it in Mexico while away? When she applied for the Temporary Import Permit, she agreed to take the vehicle out of Mexico before her INM visa/permit expires. If she leaves Mexico, especially by flying, INM cancels her FMM (there have not been FMTs since May 2010). When she leaves Mexico, without taking the car out, then her car becomes illegal. If she then returns later under a new FMM or whatever, and drives the car – if the police stop her, they can permanently confiscate her car on the spot for violating the agreement she signed. She must either take the vehicle out of Mexico, or get an FM2 or FM3 before leaving Mexico. If she gets an FM3 or FM2 Rentista, that would extend the expiration date of her INM visa by a year. If she gets a No Inmigrante FM3 Rentista, then she could keep the car here. **There is one exception/loophole she might wriggle through: If she drives exclusively in one of the Free Zones, then she could drive out of Mexico, have Aduana remove the Import sticker from the windshield, and then re-enter again with NO Temporary Import. This only works for driving in the Border Zone (25 km of the border) or in the special free zones of Sonora, Baja California, or Quintana Roo. Under this special program, she is not allowed to drive outside of those special free areas, and her car could be permanently confiscated if she drove into other Mexican States. I will be visiting a friend in Puerto Morelos and he has offered the use of his car to me. It is a Canadian plated car? Am I able to drive it. It is a yes to all the above. Some more info. The owner of the car drove it into Mexico on Jan 5, got his car permit and a FMM. He is however going to be flying out of Mexico for a week in mid February, the week he said I could use the car. Is it still okay for me to drive the car when he is out of the country? When he got a Temporary Import Permit (TIP) for the car, he agreed to take the car out of Mexico before his INM visa expires. When he flies out of Mexico, his visa expires, and the car becomes illegal to drive for everyone, because the FMM expires when he leaves Mexico, and he automatically loses his deposit for not keeping his agreement. Any driving of the car after he leaves, puts the car at risk of being permanently confiscated by the police. 1. Take the car to the border, turn in the TIP, and then sell the car in Belize, before he leaves Mexico. 2. Get an FM3 before he leaves (which is what most expats with TIPs do), which adds a year to the car’s TIP expiration date. 3. Leave Mexico, return later, do not drive the car, forfeit the security deposit, get an FM3, apply for a 3-5 day Safe Returns program permit to take the car to the border to turn in the expired TIP, and use the new FM3 to qualify for a new TIP, pay a new deposit. 4. If he is willing to only drive the car in Quintana Roo, he could drive to the border now (Chetumal), and surrender the car’s TIP now – having Aduana remove the windshield sticker, and recovering the cash deposit. Since Q. Roo is a Free Zone (special tourist zone like Baja California), he can return with the car into Q.Roo with no permit, but the car CANNOT be driven outside of Q.Roo, or it is liable to be confiscated. Under Option 4, he could use the car inside Q.Roo, get an FM3 later, and then make another trip to the border with his new FM3 to get a new TIP. This means 2 trips to Chetumal, but it saves the car, saves the deposit, and gives 2 chances to enjoy Chetumal, duty free zone shopping, and the duty free zone casinos. One more thing to add. He owns a home in Q Roo and does not plan on driving the car back to Canada only in Q Roo. He also does not have time to go to Chetumal before he leaves Mexico. As he only plans to drive it in the free zone of Q Roo can he wait until he returns back to Mexico to have the TIP removed and am I able to drive it? I don’t know how the Q. Roo police handle people driving with expired TIPs. He will forfeit his deposit if he flies out of the country. In theory, the police could confiscate his car for driving with an expired TIP – but because Q. Roo is a special zone, they likely do not check – but I have not read any reports either way of how they handle the issue. Most traffic stops do not involve having the TIP checked. Accidents and insurance may be another matter. If Q roo is a free zone would a TIP actullaly expire seeing that one is not required? Do you have a link that states Q Roo is a free zone? I would like to print it off and have in the vehicle to present to the police in case then question it. Again thanks for all your help Steve. It is the territory between the international boundary in the north and the parallel line a distance of 20 kilometers into the country in the section between the boundary of the partial region of the state of Sonora and the Gulf of Mexico, as the border town of Cananea, Sonora. This official Aduana description of Q. Roo as being part of the special border region shows that Q. Roo has the same rights for tourists to drive their cars without permits etc. in the special border zones. Even if the car owner keeps the car only within Q. Roo, he is still required by law to return his TIP to the Aduana office at the border, BEFORE he flies out of the country cancelling his FMM. He definitely loses his deposit, and he also risks having the car confiscated by not returning the sticker. By signing up for his Temporary Import Permit, the car owner agreed to return the car to the border before his visa expires or is surrendered. Hope this information helps. We don’t write the laws, we only report them. The links don’t work. Is Q Roo still a Vehicle Hassle Free Zone? Q. Roo has never been a “Vehicle Hassle Free Zone“. ~ Foreigners can have foreign-plated vehicles without a Temporary Import Permit (TIP) … but local police still hassle some foreigners, so KNOW THE LAW. ~ Mexican law says foreign plated vehicles in Q. Roo MUST have current valid registration & current valid plates from their home state~province. ~ Mexican law says foreign plated vehicles in Q. Roo MUST have current valid insurance. ~ Foreign plated vehicles with no TIP are not permitted on Federal properties in Q. Roo, like the Cancun airport. If you violate any of these conditions, Q. Roo police do harass foreigners in foreign-plated vehicles. I see you don’t touch on Mexican car insurance here, but I have come across some horrid tales that even if you are in an accident with full coverage of Liability ($500,000 USD) and ‘fianza garantizada’ y asistencia legal hasta $50,000 USD that you could STILL be sent to the police station for a couple days if there is an injury. Is this true? It almost makes me want to take public transportation. I’m a safe driver, but I can’t imagine being treated like a criminal for an accident. I love Mexico, but it sure is different here! We touch on these issues in a different article. There is no official or standard of “full coverage liability”. Basically, our agent said for minimum protection, we need “Gastos médicos occupantes”, “Responsabilidad civil”, “Asistencia juridica”, and “Asistencia en viajes”. This combination of liability coverages is supposed to cover damages to any other vehicle(s), passenger(s), other injured parties, damages to property, and fiscal bond protection to guarantee enough $$ protection to cover any and all injuries to people or property – to keep you from going to jail. If your limits are determined to potentially be to low to cover the damages in an accident, then your fiscal bond protection must be high enough to cover any anticipated damages, or you go to jail to wait until the police determine what the upper limits of the damages/injuries may be. Finally, it is VITALLY IMPORTANT to NOT talk with the other parties. DO NOT move the vehicle. DO NOT get out of your car, unless necessary (we had a friend who was run-over while standing in the street – struck violently hard by the other driver’s car as the turkey fled the scene, Why: because they moved the vehicles NO CHARGES WERE FILED against the driver who hit our friend – putting him in the hospital). You really must keep a working cell phone in the car, and CALL YOUR INSURANCE COMPANY. Sit in your car until your Insurance adjuster/representative arrives on the accident site. SAY NOTHING, except to your Insurance rep. and give minimally necessary answers to the police. Let the Insurance rep handle everything. thanks again, Steve! I’m confused about the four types of liablity coverage. Do you have the link you can share on this topic? I searched your site under “Driving in Mexico” for an article, but no luck. I can keep searching. GNP Seguros only offers Liability of up to $500,000 USD which should be enough, one would think. I know with the new insurance law, many insurance companies are suggesting $500,000 liability with the $50,000 legal assistance. Never mind… I see your reference of the 4 liabilities above. I think it may be different on mine since it is a Mexican policy for a TIP car. But, it does include those, just not under liability. Glad to hear you are covered ! I entered the country with a TIP based on an FMM, and (didn’t know I was doing any wrong) have flown back and forth abroad twice since then, so now I’m on a different FMM. I am waiting approval of my FM3. My TIP just expired. The car is still here. What would anyone suggest doing? This is the first time I understood that the TIP is linked to a specific FMM. Do I need to get a permit to drive the car out to sell it in Texas? Will they confiscate my car if I stop at Banjercito to show them I’m leaving the country with it? The Aduana/Hacienda/SAT rules say you should get a Retorno Seguro permit, which gives you a 5 day permit to legally drive the car out of the country. When you exit Mexico, Banjercito offices are glad to receive the paper TIP, take off the windshield sticker, and give you paperwork that proves the TIP is cancelled. Thank you so much Steve. It’s what I thought, but it’s so helpful to hear that you come to the same conclusion. Good updates – especially for people in Mexico City. For anyone considering driving the coast road from Merida to Texas–don’t! Unless you want to run the risk of being abducted at gunpoint, and robbed of your belongings. We just returned from a trip to the US, mainly to attend a music conference in Chicago, but also to drive our Texas-plated Grand Cherokee out of the country and import it back in through Laredo. We became permanent residents last February and had done this for my Jeep in July through Grupo Cuevas in Laredo. At that time, we had gone up the coast to Ciudad Victoria then on through Monterrey and Nuevo Laredo; and we had returned the same way. This trip, we were leaving through Matamoros. Forty minutes north of Ciudad Victoria, we were accosted by five men in a pick-up wearing camouflage and flak jackets with “Policia” caps and brandishing automatic weapons and handguns. They drove us off a side road approximately 35 minutes (very fast) to a nondescript rancho where they held us for 4 hours while they went through and robbed us of most valuables, continually demanding more money. Since they didn’t hide their faces, and, as we observed at one point, they took very large plastic bags out of the trunk of one of their vehicles, we were convinced they would kill us (or else why take us so far from anything?). After a couple of hours, the jefes arrived and one addressed us in English saying they wouldn’t hurt us but they just needed more money. We explained (again) that they had everything already and we weren’t rich people. After conferring among themselves for another hour or so, he told us “what the boys had done was a mistake.” And that we were in “a black Grand Cherokee” and “they had been looking for guns and drugs.” He said they were going to give us our stuff back and let us go. I asked him if they were going to kill us and he said, “No, no, we just needed some money.” He also asked if there was any kind of device in our Jeep, our phones, or the computer that the Americans could use to track them. They drove us back the way we came, and about 10 minutes before we got to the highway, the driver got out of our Jeep, walked back to the pick-up, got in and they drove back toward the rancho. My husband jumped out of the back seat and into the driver’s seat and we raced to the highway, turned north and drove as fast as we could to the border. The FBI agent we reported to in Houston told us that, obviously, they weren’t cartel or we wouldn’t be here today. They were just thugs. Small consolation that wouldn’t have helped knowing as it was happening. Did we get our stuff back? One American cel phone, one video camera (no cables), and one credit card (and the Jeep, of course). We’re now a statistic but not one of the worst statistics. We’ve been driving that route for 18 years but we sold the Jeep after we got to Houston and will never drive again. I am so very glad that you are both safe and OK.
May we publish this as a post and an article for others to read? Hi Steve, I have three dogs . I have permanent residency in Mexico. I am not an american. I have a multiple entry visa for Mexico. I WANT TO TAKE MY DOGS BY ROAD INTO THE USA. WHAT TYPE OF CAR , WHAT PLATES DO I NEED , SO THAT I CAN I DRIVE FROM CANCUN, ACROSS MEXICO, INTO THE USA AND UP TO CALIFORNIA. CAN I USE A RENTAL CAR THROUGH TO CALIFORNIA. You can drive a Mexican plated car in the USA for up to a year. I don’t know how it works for a Mexican rental car. Check with US CBP. Here’s my situation: I just moved to Quintana Roo with my 2007 Nissan Frontier (VIN begins with a “1”). It currently has Florida plates and a TIP that expires in 5 months. I have applied for my residencia permanente and expect to have it in about 3 weeks. I have read a lot of conflicting information on the web about the age of a vehicle eligible for nationalization. Is my car too new to be eligible for importation? If so, by the time it is old enough I will have my permanent resident status and will not be allowed to import the vehicle. Is this correct? Assuming I’m understanding this correctly, then do I need to go to a Banejercito office before my immigration status changes from tourist to permanent resident to have Banejercito remove the TIP and refund my deposit? If so, do I need to drive all the way down to Chetumal? Or is there a Banejercito office nearer to Tulum where I live so I can get the TIP removed there? Because Q.Roo is a free zone is it true that I can drive my foreign-plated vehicle without a TIP legally only within the borders of Q. Roo? Can I also legally drive it across the border at Belize and drive it back to Q. Roo without a TIP or importation? Unfortunately there is a lot of bad, … incomplete, or out-of-date information on the web. Personally, I would stick with Rollybrook.com or this site ( Yucalandia.com ) as both Rolly and I work hard to get and publish the answers that work – based on real-world experiences of talented people. Is my car too new to be eligible for importation? If so, by the time it is old enough I will have my permanent resident status and will not be allowed to import the vehicle. Is this correct? ~ Yes, to preserve the deposit, you must surrender the TIP before your Residente Temporal expires. ~ Yes, you need to drive the modest distance to Chetumal (2-3 hours), or try to use an Aduana office at a seaport like Mahaul(sp) or Cancun – but these other Aduana offices with Banjercito branches nearby may not have much experience in doing this, while it is very routine at Chetumal. ~ Correct on all counts. But with Florida plates, your car will become illegal when the Florida registration expires – because Florida does not re-register without having a certified emission test certificate (???). When the Florida registration expires, your car can be confiscated at any time, and your accident insurance coverage may also be cancelled when your car becomes illegal in Mexico (due to no current US registration). I don’t know for sure but I think you have to take it to the border and get the TIP removed, then “re enter” the country with the vehicle based on your permanent residence status. I think you used to be able to change status inside the country but heard this option was removed. Be thankful you only have to drive to Chetumal. I had to go from the DF to Texas and back! Seaport Aduana offices with Banjercito offices nearby can accept TIPs, and cancel them – because they are required to do it for every TIP car that is legally shipped out of Mexico from the port. Friends of ours did this at Aduana Progreso, here in Yucatan, when they shipped their Florida-plated car back to Florida. Even though Aduana at the Progreso port does it, does not mean that Cancun and Mahual do it smoothly…. Need insurance for a South Dakota plated car for USA/Canada travel. Have Residente Temporal permit. Car TIP will expire in April 2015. I have a question not about a car but my Driving License. I am an American Citizen living in Germany and Mexico. I have a German Driving License and a Mexican Registered car in Guadalajara. Because my Wife is Mexicana, next year, I am able to apply for Mexican Citizenship. If I become a Mexican citizen, must I have a Mexican Driving License or is my German License still good? I will not (nor can I) give up my German License. If need be, I can re-register the car in my Wife’s name. I have a Residency Permit for Germany in my US Passport and it should be no problem to have an additional Residency Permit posted in my Mexican Passport. In most Mexican states, your German license is sufficient. The Jalisco “Rules of the Road” is substantial, and has been revised, so I will not try to advise you on Jalisco’s current policies. You could contact Lic. Spencer McMullen at Chapalalaw.com and use your question to start establishing a long-term relationship with him. He is superb in many areas of Mexican law, and would make a valued long-term advisor and aide on how to do things well in Guadalajara and Jalisco. I am a Canadian, with a classic Canadian car (1981 Monte Carlo). I drove my car to Mexico last year and received the temporary import sticker. I flew back to Canada, leaving it parked in Puerto Vallarta at a friend’s, and the sticker on my windshield is now expired. I’m flying back right away and would like to drive my car again! I heard there are exemptions for classic cars, and just want to get back on the road. Any advice? Thanks a bunch! You basically get a Retorno Seguro permit, a 5 business day permit that allows you to legally drive to the border. When at the border, you apply with Aduana to have the car permanently imported. Currently 6 year old and older NAFTA cars are eligible to import, but many knowledgeable brokers are saying that the rules will change on Jan 1, 2015, disallowing all cars older than 10 years, except for legally qualifying classic cars. You would hire a licensed broker at the border to complete the import process. My wife and I are planning a 5 to 6 month stay in the Yucatan area this winter and rental car prices are high for our budget, looks mainly due to insurance. Can I simply buy a 5/6 month policy locally on a rental car, skipping the high price insurance the rental companies charge? Or could I take it a step further and buy a used car and sell it later? Lastly, what does car insurance cost per year? Appreciate your time and look forward to your response. We’ve paid between $400 – $600 USD per vehicle for insurance this year. We have no idea if you can get insurance on a rental car from an independent agent. Good used small-midsize cars with about 60,000 miles (100,000) had been available for about $6.000 – $8,000 USD. I’ve only bought cars here, so I don’t know how quickly they sell. For each car we pay $2,800 pesos per Year, liability only. That includes a separate liability only coverage in the US. (separate policy in English written by a US company). Only for Mx. plated cars. Registracion Vehicular Federal ? Heard this rumour on the weekend, Have you hear of it? Apparently it is a new sticker requirement for Mexican plated cars this year in addition to the standard state yearly sticker. No charge for it. You have to have it placed on your car by April 1st. It is a federal requirement and a way for the federal government to track vehicles. I suspect the date proves the falsehood. Hi! I’m a residente temporal who has been living Quintana Roo. We drove our car from Florida. Since we were in the free zone we decided to remove the TIP. Now we’re moving to San Miguel de Allende and need to get a new TIP. The car is currently in storage in Q. Roo while we visit the U.S. I was hoping to apply for the TIP online through the Banjercito website and receive it while still in the States but it appears there is no option for residents to do so – only those coming in as tourists. Do you know of any way to apply online? Or am I stuck heading down to Chetumal to the Banjercito office there once I get back to Q. Roo? Also, I don’t completely understand the process for linking your TIP to your residency term. Can I do that when applying for the TIP or do I have to visit Aduana separately after receiving the TIP? If so, how long does that process take And once your TIP is tied to your residence can you leave the country at will without your car? The car must go to a border for Banjercito/Aduana to inspect the car, verify the VIN etc. The process takes about 20 minutes if you have all the papers & copies, including a current valid registration, and including documentation of cancellation of the old TIP (or at least the original paper document and sticker still on the car). The new TIP is ‘activated’ and linked in the Banjercito nationwide database to your INM visa number. The TIP expiration date = your INM visa’s expiration date. If you have a Visitante Visa, the TIP must be surrendered every time the foreigner exits Mexico. Residente Temporal visa holders can exit Mexico at will without doing anything with the TIP. Steve – we need to leave Cancun 9/1/17 with an expired Tip issued in Sept 2015. To top this off, the ILL. plates expired Oct 2015. The plates will have to be reissued when (if) we return to the US. We have no insurance on the car because we are told it is not mandatory in Mexico (is this true?). As I understand that you feel obligated to advise me of possible bad ramifications; I’m having a hard time seeing the Police pull two 62 yr olds & their 2 dogs out of their car and confiscate it for trying to finally get the car out of the country. As you know, getting a retorno letter through Mexico City is now close to impossible to do. So when I tell the Police that I am trying to remove the car that broke down after our arrival here out of the country; have you ever heard of this happening? Get a Retorno Seguro permit and drive the car out of Mexico. Mexican auto insurance is required for driving on Federal Highways or Federal property (like the Cancun Airport). It’s foolish to not have Mexican auto insurance, because if you get in an accident, the police can easily hold you in jail … indefinitely … until your legal representative can prove you have liquid cash … up to $3.5 MILLION pesos (e.g. Yucatan) … to pay for any and all medical treatments needed by anyone involved in an accident or accidental deaths etc. It is not impossible, but can take 4 to 6 weeks to get the Retorno Seguro permit. There are verified reports of American’s cars being confiscated permanently, stranding the travelers, for driving an illegal foreign-plated car that they say they are returning to the USA (but it’s very unusual). Sitting in Mexican police detention (jail) with no food & no water (except that brought by friends, family or insurance reps) … indefinitely … after a minor traffic accident … is definitely not on our Bucket List. especially when having Mexican insurance gets us a legal representative (who knows how to handle the police) at the scene of the accident – short circuiting so many hassles. Hi, my family and i are flying to Cancun, spending about 3 days before driving into Belize/ Guatemala for about 6 days then returning to Mexico for 2 days and flying out of cancun. I am curious as if we have to purchase all new FMM when we cross back into Mexico since they are good for 180 days… We are driving a rental car with permits from agency/ government. WE are permanent residents who would like to borrow our friends car that is here on a tip, they have a simple tourist 180 day Visa. Is this permissible? I become a Permanent resident next month and understand I can no longer drive my BC plated car. Because the car is now illegal in Mexico I also believe my insurance will be invalid. With a ‘Returno Seguro” permit, will my insurance be valid as I drive it out of Mexico? It depends … It all depends on your insurance company’s policies-rules on this. Contact your insurance agent … some companies do not care.